Successful dual language education models ensure fidelity to the essential features of program design, e.g., at least 50% of instructional time must be in the minority language. Once non-negotiables are in place, however, teachers and principals make many important decisions regarding language use, curriculum, and assessments as issues emerge in their local context. This day-to-day decision-making affects how and the extent to which dual language program’s specific linguistic, cultural, and academic goals are met. How can we approach localized decisions in a principled way that will support linguistic and cultural pluralism in our programs and schools? 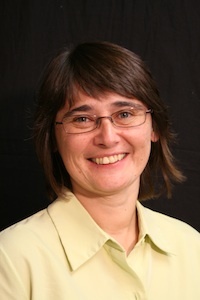 Ester J. de Jong is Associate Professor of ESOL/Bilingual Education in the School of Teaching and Learning at the University of Florida in Gainesville, Florida. Her research interests include: integrated, linguistically diverse, classroom settings, language policy, and dual language education. She also works in the area of mainstream (standard curriculum) teacher preparation for bilingual learners. Her book, Foundations of Multilingualism in Education: From Principles to Practice (Caslon Publishing), focuses on working with multilingual children in K-12 schools. Her work has been published in the Bilingual Research Journal, the International Journal of Bilingualism and Bilingual Education, Language Policy, and Language and Education.